My biggest mess maker is also my most willing helper! 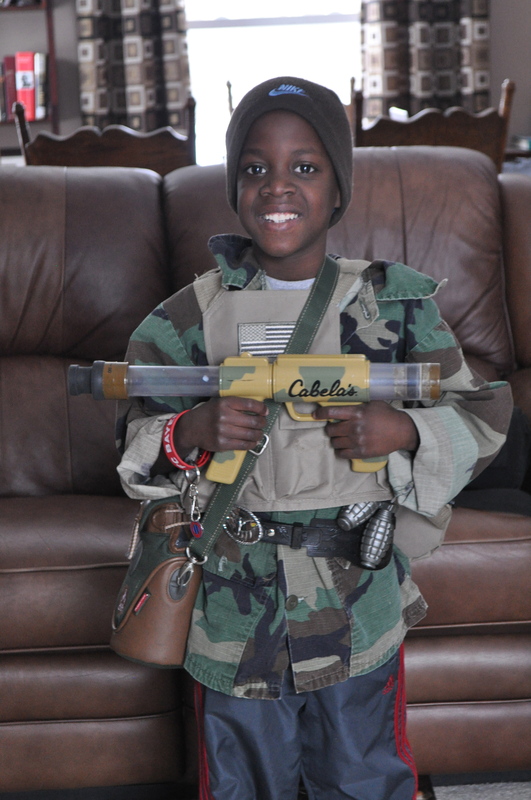 Here’s my PJ all decked out in his army gear. I’ve done a lot of mama-fussin’ lately. Laundry, messy floors, dirty dishes, and stuff, stuff, stuff in the wrong-wrong spots! Do any of you fall into the same trap? Frustrated over messes that are created by some of our very best gifts from God? It’s one of my recurring sins. And every time I think I’ve found some freedom from it, I go through another bout of it. But each time God also has different lessons to teach me. Tonight it was straight from the book of Mark. Be a child with Me. It was like the Holy Spirit whispered the words inside my head, taking Feinberg’s words and applying them directly to my situation of the moment. It was a new lesson. There have certainly been times when I’ve been reminded to BE the grown-up: Don’t sink to the level of the child. You don’t have to argue simply because they are being illogical. You are the MOM. I’ve given you this responsibility. There have been other times when my view of “mundane” tasks has been challenged. (Brother Lawrence has been a huge help in this area with his dishwashing example and his mantra: It’s all worship.) No one else will notice that I cleaned the bathroom (unless I didn’t do it for a really long time), but if I’m doing it for the Lord rather than for people—then it’s worship! And there have been lessons about looking to Jesus. “Don’t become weary. Consider Jesus and what He endured.” That certainly puts things in perspective. But those weren’t the lessons this night. I had something new to learn. Be a child with Me! Into my mind flashed pictures of my children at that age of toddlerhood when being Mommy’s little helper was a privilege and a joy. A rag, a bucket, and a request: “Want to clean the kitchen floor?” was a highlight. There was no heaviness to the task; there was a thrill of getting to do “mommy’s work,” of working alongside MOMMY! Wow! That’s a new way to see homemaking! (or any task we find wearying or repetitive). I am working alongside God to make a home and a family! HE carries the responsibility. HE keeps track of what should be done first and then next and last. And I simply get the joy of being His child! So true! I think as a woman we have this desire in us to make things perfect even though it is unattainable in this world. In some of us it is stronger than others and the force is strong in me. 😉 I like a tidy environment so I feel for ya! What’s ironic is that before I had children I was the messy one! What a wise comment about the perfectionism! I not only want my version of perfect, I also want everyone else to share the same version! Jen, I so appreciate your honesty in your struggles as a mom with little ones. It’s also good to remember that all too quickly they grow up and are out of the house on their own. I am glad you are learning to enjoy this moment as mom….messes and all! You are a good mom! Mom, I SO appreciate your comments and encouragement. You are so right. They grow up quickly. When I look back, the years have by gone very, very fast! Learning to cherish this time is sometimes difficult but very necessary.